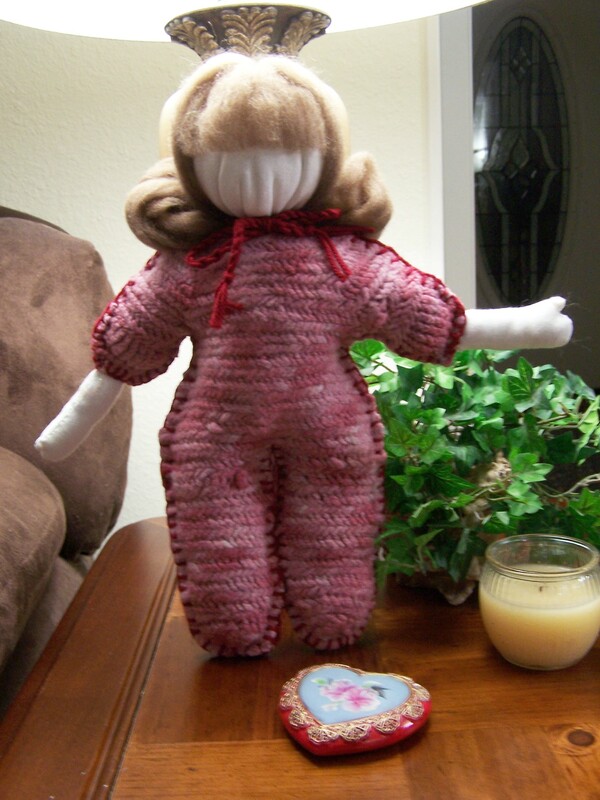 Posted on November 12, 2008	by Linda S.
Can you guess what she is made from? I made my DH a pair of nalbound socks some time ago. I also knitted him a green pair from washable acrylic/wool yarn that could be thrown in the washer and dryer…can you guess what I am getting at? You’re absolutely right… he threw the nalbound ones in with the others and of course…they shrunk. I kept them around moving from one table to another because I just couldn’t throw them away… The yarn was spun on my spinning wheel…dyed with kool aid … then nalbound… Just couldn’t see throwing them away. This entry was posted in Crafts, Dolls, Handcraft, Handwork, Historical Textile, Naalbinding, nalbinding, Needlework, Refashioning, Sewing, Spindling, Spinning. Bookmark the permalink.